Enjoying the music at the Whitecross Street Fair. Mo, that is a gem. You have caught the moment to a T. The look on her face, the hair swinging out, the twist of the arms: absolutely spot on. So fun, so young and already so fashion conscious! That striped tee looks like something J.P.Gaultier might do. You go girl! that wee lassie is rockin' it. Perfect! What a face of joy! What a great shot. I love to watch kids reactions to music. About the Mac, so far so good. I took my first one to one session Sunday and have another this evening. I'm not completely transferred yet because I'm still struggling with small things like emailing photos. I can't seem to get one to attach just as an attachment and not embedded in the body of the email. That's what I'll work on tonight. I'll have to post an update later this week. aw, how cute is that?!! Looks like she's having a fab time! Great photo! Hopefully she can keep that joy and spontaneity when she gets older. All the ages were there but she was the most spirited! Nice one. Very nice, Mo. 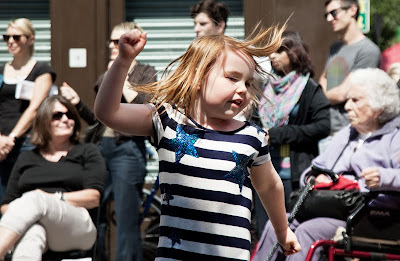 Dance music gets people of all ages moving and in high spirits. What a fantastic photo. People in various ages and that little girl so full of life.